It was a disappointing weekend for most of the area’s cricketers as an afternoon of rain put paid to many results in Four Counties. Milton Keynes (pictured) managed to get in the first innings of their game against Thurleigh, and had the visitors all out for 224, thanks to Joe Fairbrother’s 4-40 and Aatif Basheer (pictured) taking 2-67. But rain at the interval meant the game had to be drawn. It was the same outcome in the matches between Biddenham and New Bradwell - who incidentally took over top spot as a result of their draw - and New City and Elstow. Olney though were able to beat the rain with the rapid dismissal of Aspley Guise. James Houghton took 5-14 as Olney skittled Aspley Guise for just 93 in 28 overs. And it took Olney just 23 overs to rattle off the runs, with David Livermore top scoring on 40 as the visitors won by six wickets. There were no results in Division 2 or Division 3, but in Division 4, New City 2nds (76-1) were winners over Elstow 2nds (75) as Nitesh Vadhwana took 5-23. In Division 5, Soulbury Village (169-9) beat North Crawley 3rds 83-9), while in Division 6, MK City (63) lost to Buckland & Aston Clinton (69-2). There was a smattering of action in Division 7 though, not least for New City 3rds. 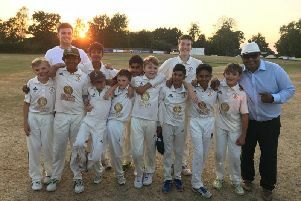 In a team featuring a 12-year-old, two 13-year-olds and a 14-year-old, they skittled Wing with Wingrave 2nds for a remarkable 7. Yash Tailor, 13, scored his first half century in senior’s cricket as he registered 62, while Arun Short took 3-0 as Wing were sent packing. Westcroft 3rds (152-5) brushed off Ivinghoe & Pitstone 2nds (151-5) as Nazir Aziz hit 65 not out, and Great Brickhill 4ths were bowled out for 80 by Edlesbrough 2nds (81-6).